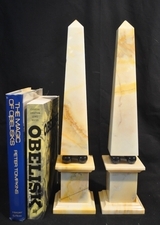 Obelisks have become more than just objects of fascination and beauty. They are key pieces of contemporary interior design. 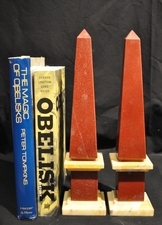 A vintage obelisk is one that is less than 100 years old and contemporary obelisks are those created recently. They come from all over the world and crafted by some of the best artisans. They come in precious rare minerals such as lapis lazuli, metals like bronze and brass, classic marble, and the decorator favorite – rock crystal. 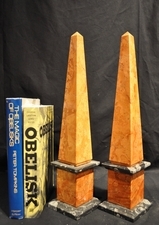 Decorate your home or office with our wide selection of vintage and contemporary obelisks. They come in all sizes and colors to fit any décor. They're perfect for creating a sophisticated look in your entryway, living room or office. Use multiple obelisks to create a stunning tableau. 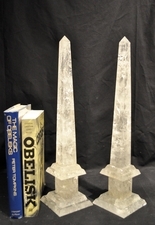 Only Obelisks scours the globe for special and stylish obelisks that you'll treasure for years. We want to ensure your happiness with our generous return policy. If there is any reason you don't like you're obelisk, then simply return it within 30 day in its original packaging and condition. Pair of Nero Belgio and Siena marble obelisks with circular shield inlays on all four sides of the plinths. Wonderful size. 13 1/2 inches tall. 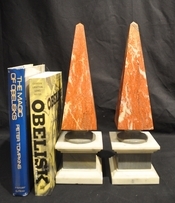 Pair of vintage sienna marble obelisks with black marble trim at top and base of the plinth. Each stand 14 1/4 inches tall. Vintage black slate and pink onyx obelisks, sourced from an estate. 15 1/2 inches tall. Vintage green malachite obelisks. Color is vibrant and veining is distinctive. The plinth is faced with rectangular shields. 15 1/4 inches tall. Italian deep green Alpi marble obelisk with fossil-like veining. 16 3/4 inches tall. OnlyObelisks custom designed deep Green Guatemala marble obelisks with jet black marble ball & plinth accents. Green Guatemala marble is a rich deep green, & the jet black marble accents enhance the design. 18 3/4 inches tall. Italian green marble Alpi obelisk with fine detailed veining. 16 3/4 inches tall. Handsome small green marble obelisk. The size makes it perfect for a desk or bookshelf. 12 1/4 inches tall. 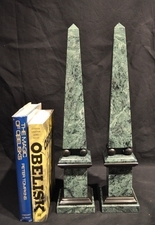 Pair of vintage deep green marble obelisks with brown marble banding on plinth. 21 1/4 inches tall. Deep maroon and grey-white marble vintage obelisk. The veining is rich and fascinating. Each side is different, and full of mineral details. 12 1/4 inches tall. 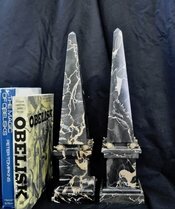 Italian chocolate marble obelisk pair with fabulous fossil-like veining. 19 3/4 inches tall. 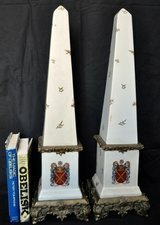 Vintage Italian obelisks with rouge obelisks (top), and cream and grey plinths. Unusual Italian design. 14.5 inches tall. Vintage pink marble obelisk with black and white marble trim. Could be a near pair with a Item 508 (see photo attached). 15 3/8 inches tall. 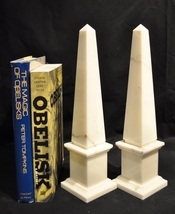 Pair of cream marble neoclassical style obelisks. 16 1/2 inches tall. Vintage Italian black Portoro marble obelisks mounted on bronze turtles. The marble is a mix of yellow-gold veining in the black. Each side has its own interest. 15 5/8 inches tall. Monochrome Italian marble obelisk. Black marble has very interesting white veining, making this a graphic and interesting obelisk. 19 1/2 inches tall. Vintage green marble obelisk with white marble trim. The base is black onyx, and has bun feet. 19.25 inches tall. Rich red marble obelisks with black marble banding in a neoclassical style. 16 3/4 inches tall. Pair of deep pink marble neoclassical style obelisks. Rich and versatile color. Vintage Loyd-Paxton design. 13 inches tall. Deep pink marble neoclassical style obelisks. The marble is a very rich, attractive color. Vintage Loyd-Paxton design. 9 inches tall. Vintage pink marble obelisk. Wonderful size. 12 inches tall. 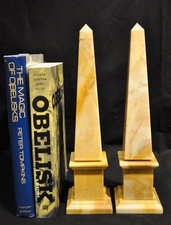 Tall vintage pair of specimen marble obelisks on handsome brass plinths. The marbles are shades of ocher browns stacked in three sections. Each stand 31 1/2 inches tall. 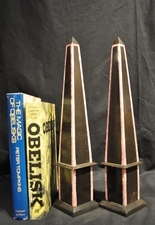 Smart pair of vintage Art Deco style brass obelisks on a wood base. 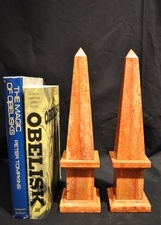 Both obelisks have nice patina. (Note detail for condition issue.) 20 inches tall. Vintage Loyd-Paxton cream marble obelisks with pink marble trim and pick marble shield insets on each face of the plinths. 19 inches tall. 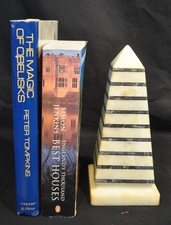 Handsome and graphic vintage cream and black marble striped obelisk. Neoclassical design with a modern look.15 3/4 inches tall. Tall vintage multicolor striped specimen marble obelisk, with three level stepped base. 23 1/4 inches tall. Obelisk of Italian pietra dura inlaid mosaic set in black marble. This is likely an antique and set with semi-precious stones. 18 inches tall. Vintage cream quartz obelisk with brown banding. 9 inches tall. 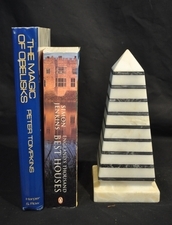 Vintage black and white striped marble obelisk. Could be a pair with 'striped obelisk (2)'. 9 1/2 inches tall. Unusual black and white striped marble obelisk. Could be a pair with 'striped obelisk (1). 9 1/2 inches tall. Very tall pair of Louis XVI-style decorated porcelain parcel-gilt obelisks, with coat of arms painted on one side of the plinth, and painted leaves scattered on the obelisks. 29 1/2 inches tall. Stunning and very tall lapis lazuli veneer obelisks with pietra dura decorated plinths. Each panel of the plinth features a unique bird and foliage design. 45 inches tall. Tall green wood Chinoiserie style obelisk with gold painted decoration on all 4 sides. Approx. 3 feet tall (36.5 inches). Black and yellow cream marble obelisk with detailed veining. 16 1/8 inches tall. 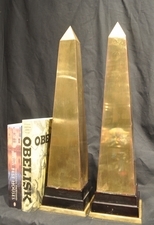 Obelisk with faux wood design on metal supported on four balls on a stepped plinth. On one side there is subtle decorative pattern in the metal consisting of six ovals and one rectangle. 23 1/2 inches tall. Black marble obelisk in a sleek modern style. 9 1/2 inches. Vintage decorative blue patinated metal obelisks with glass hemispheres attached on each side of the plinths. Unusual design. 17 1/2 inches tall. Vintage blue and white porcelain obelisk. Flower decorations on all four sides. 14 /2 inches tall. 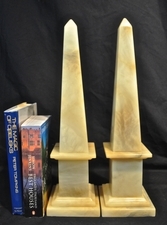 Impressive cream-colored cast stone obelisks, for garden or indoors. 32 inches tall. 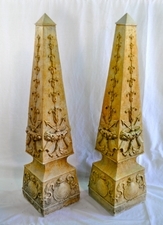 Colossal PAIR of green marble obelisks with bronze neoclassical style decorative mounts on all four sides. 56 inches tall!